Breeding of Lagottos is extremely near of our hearts as we have really fell in love with this lovely and very young breed. Our coals is to breed true Italian Lagottos with correct temperament, correct type and health. Each dog we use for breeding has been hip and eye check. We are also breeding English Springers and Cirneco Dell'Etnas. 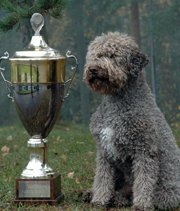 We have been awarded of Finnish Kennel Vuolasvirta-award of succesfull breeding of English Springers 2011 and from Lagotto breeding 2012. We have bred over 50 champions, Lagottos and English Springers. Welcome to this our new website. We are still working hard with this, so don't forget to visit another time too! We have puppies regularly available. 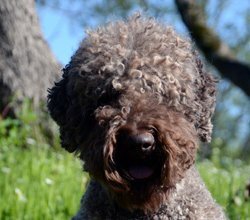 If you are interested in any of our breeds or dogs, don't hesitate to contact us! Go straigt to PUPPIES page! 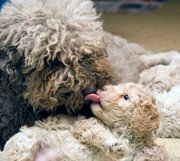 The very first Foogel Lagotto litter was born 2001. Since that we have bred or owned over 50 champions and our dogs have been doing great also in different activities. Specially Foogel Lagottos are very well known of their lovely characters!